This letter was published in the Gazette on March 1, 2018. See the previous letter on this topic here. The subject of Ms. Gallelli being paid for writing the Village newsletter has been a controversial matter in Croton for many years, and has been a matter of public discussion for more than 10 years. My letter was in response to the narrow issue of a recent Village Board resolution and subsequent discussion in the Gazette, but since Mr. Masur (The Gazette, week of Feb 22/28) wishes to discuss the 14 year backstory I will address Mr. Masur’s points at this time. Mr. Masur is correct that Ms. Gallelli was the sole author of the newsletter for 14 years, and that this continued across the tenures of three Village Managers. But as I stated in my original letter (The Gazette, week of February 8/14—see below) this does not mean that the practice was compliant with Village Code nor that the practice should continue. Mr. Masur says that “the Village owes Ms. Gallelli our respect and gratitude.” The taxpayers of Croton expressed that “gratitude” in the form of a check. At roughly $4,000 per year for 14 years (plus $3,000 per annum for the years as an elected official), I would say that Ms. Gallelli should not be complaining about a lack of taxpayer “gratitude.” If Ms. Gallelli feels that she is not given sufficient honor and acclaim for her efforts by the residents of Croton, then she should reconsider why she is a politician. If Mr. Masur or Ms. Gallelli feel that mere discussion of a municipal official’s compensation is “libelous” they might want to consider that Ms. Gallelli is—at least by titled position—a public servant. Failing that, Mr. Masur and Ms. Gallelli have their recourse and I urge them to pursue it in the appropriate judicial venue. Since the days of John Peter Zenger, New York politicians have tried to intimidate the citizens and the media. I am grateful for this newspaper and the online outlets which give the residents of Croton a forum for speech. In fact one of the earliest public criticisms of the payments to Ms. Gallelli were from a loyal member of Mr. Masur’s own (Democrat) organization. Those comments were prompted by a comment at the Village Board meeting of June 18, 2007 by a (Republican) resident suggesting that Ms. Gallelli include a particular item in her next Village newsletter. This prompted an inquiry by a (Democrat) resident who uncovered the details of payments which had been going on for 5 years at that point. For many residents, the first time they heard of the payments to Ms. Gallelli was on July 2, 2007 when the blog authored by the (Democrat) resident posted a tart comment wondering whether there had been any competitive bidding process and whether there were other “sweetheart” deals undisclosed to the public. By 2010, the Village briefly attempted to go “green” with online publication commencing with the June issue: the Village would only print a limited run for distribution at the Library and Municipal Building. Estimated printing and postage savings were $12,000 per year. This is an often overlooked aspect of the newsletter: the environmental damage and distribution costs of hard-copy media. At the time, this change was viewed favorably by the same local (Democrat) blogger who authored the 2007 criticism of Ms. Gallelli’s compensation. When a payment practice is a matter of public controversy for more than a decade and is condemned by Croton taxpayers of all political stripes, the time for change is long past-due. That is what was finally done on November 20, 2017 with passage of the Board of Trustees resolution by a vote of 4-1. Mr. Masur makes much of the period from 2002 through 2006, and his observation does highlight the narrow scope of the 2017 Board resolution. I would have liked to see a broader scope, but the resolution does prevent recurrence of the 2006 through 2016 situation and that is better than doing nothing. One key point which was never addressed by either Mr. Masur or Ms. Gallelli is the applicability of Village Code chapter 54. This omission is as understandable as it is telling: even after 14 years the classification(s) of those tens of thousands of dollars in payments remains unclear. Apart from possible violation of Village Code, classification of both pecuniary benefit and hours expended would affect the treatment of Ms. Gallelli under the NYSLRS pension formula. Mr. Masur says that there could never be any political spin to the newsletter because each issue was reviewed by the Village Manager. This implies that for those 14 years Ms. Gallelli either acted as an independent contractor or as a Village non-elected employee (in addition to being a paid elected official for 10 of those years). Mr. Masur’s letter is to my knowledge the first time that anyone has claimed that for 14 years the Village Manager reviewed each newsletter prior to publication. Even if Mr. Masur is correct in his implication, most of us in Croton are aware that the Village Manager serves at the pleasure of the Board. More to the point, the Village Manager is aware of that fact. At one point, a village resident (a registered Democrat) asked Ms. Gallelli whether the “Got a Question?” feature of the Newsletter was based on actual resident questions. After a cagy response from Ms. Gallelli, the resident FOILed and the official response of the Village FOIL officer was that there was nothing responsive to the FOIL request—in other words, Ms. Gallelli was astroturfing: no actual questions had been submitted to the Village for answer in the newsletter. In November 2015 every household in the Village received the newsletter with an above-the-fold “Got a Question?” segment discussing how “many residents” were still “understandably unhappy” with Verizon for a decision made 5 years previously. But since cessation of FiOS expansion had been announced in 2010, why after 5 years was it suddenly so important to make sure that municipal tax money and resources were used to denounce a specific company 4 days before a Village election? In fact, has the Village of Croton-on-Hudson ever before or since sent a Village-wide mailing to denounce a specific company? For those who did not live in Croton at the time, I would point out that the arrival of the newsletter occurred 4 days before Election Day, and one of the challengers was a well-liked Croton resident who is a Verizon executive. At the time, Verizon had 178,000 employees and the Croton resident had nothing to do with the FiOS rollout. I understand that as a Croton political boss, Mr. Masur is privy to more knowledge of the “process” than the rest of us here in Croton, and so it would have been helpful if Mr. Masur had disclosed back in 2015 that the Village Manager had—personally and after a review “process”—approved this inappropriate political use of municipal resources. There is a sharp distinction between what individuals and political groups do versus what is done by the municipality; it is that distinction which separates Village Hall from Tammany Hall. My letter in this newspaper a few weeks ago was addressed to the positive ethical standard that was set by that 4-1 Board resolution vote of November 2017. After reading Mr. Masur’s new information it appears that the resolution was more necessary than we residents knew at the time. This letter was published in the Gazette on February 8, 2018. New York is a phenomenally corrupt state, and as Governor Cuomo prepares to stand for re-election he is under fire for not doing enough to effectuate his pledge to clean up Albany. But as even the Cuomo-unfriendly New York Post has noted, many of Governor Cuomo’s reform proposals have been blocked by Republican members of the legislature. The lax standards for ethics benefit the self-interest of both parties in Albany, and that is unfortunate. What is equally unfortunate is the editorial stance of The Gazette (Nov. 30-Jan. 6 issue: “Outgoing Croton administration changes ‘compensation’ policy”), and the subsequent echo of that stance by Amy Ferrara (Gazette, Jan 18-24), when the Village of Croton took steps to ensure high ethical practices in Croton’s government. The resolution which passed on November 20, 2017 regarding Board of Trustees’ compensation is available on the Village website, as is a video of the Board discussing the resolution. At no point during the discussion does anybody discuss Ann Gallelli, nor does the resolution say anything about Ms. Gallelli. The language of the resolution is clear, and it references both the statutory and ethical rationale for the resolution. Neither of those matters were addressed by the Gazette article, nor were they addressed by Ms. Ferrara. There was a tradition in Croton that the Village newsletter was a patronage stipend given to a Trustee. Arguably that was always in violation of Chapter 54 of the Village Code, and certainly it was one of those “traditions” that needed to be changed to comply with the existing law. You might disagree with Mayor Dr. Schmidt’s handling of the newsletter, but there is no disagreement that he led by example: taking the newsletter out of the political patronage trough and directing that the Village Manager handle the matter in a non-political manner. For 2 years, Dr. Schmidt left the production of the newsletter to be done by the Village staff. This practice not only saved money, but it also removed even the perception of politicization of this municipal resource. That is not “petty vindictiveness,” it is ethical stewardship that respects the citizens of Croton and our inclusive representative democracy. Nobody from Croton United ever got any pecuniary benefit from the newsletter, nobody from Croton United ever got state pension credit for production of the newsletter, and nobody from Croton United ever used the newsletter to bash their electoral opponents nor their electoral opponents’ respective employers. Dr. Schmidt’s position on public service as a privilege and not an opportunity for personal gain is well known and longstanding. That is what he did with the newsletter. To suggest (as the Gazette article does) that this position was “specifically” directed at a particular individual is to ignore both the precedent which Dr. Schmidt set and also the black letter language of the resolution. The resolution applies equally to all individuals, just as Chapter 54 applies to all individuals serving on the Board of Trustees. Have we become so cynical that we prefer to believe that Dr. Schmidt and Trustees Pugh, Anderson, and Walsh were acting out of hidden spite rather than acting in what they honestly believed to be the public interest? The resolution passed 4-1, and even Ms. Gallelli explicitly stated that her grounds for opposing the resolution were procedural and not substantive. In fact during public colloquy with Mr. Walsh, Ms. Gallelli said she was not taking a position whether the resolution was substantively objectionable. The municipality is not preventing anybody from publishing a newsletter. In 2018 anybody can set up a website or Facebook page and reach a global audience with negligible to zero cost. And anybody can write to their heart’s content and email their views at no cost whatsoever. All of us have a right to express our viewpoint. What we don’t have is a right to force the taxpayers of Croton pay for that expression nor to lend the imprimatur of the municipality to our personal expression. The Village newsletter is now being produced under the supervision of the non-political Village Manager, and that is a step forward into a new age of ethical and transparent governance. Albany could take a lesson from Croton: stop working backwards from the “What’s in it for my party!” demand and instead start working forward from the “What’s the right thing to do?” perspective. All of us have a role not simply in changing the current climate of political ethics, but also in supporting and advocating for written policies that foster good government. Just because politicians have always done a particular practice does not mean that we as citizens should not make a change for the better. We proposed this policy for the same reason we adopted a policy to stop the practice of using personal email accounts to conduct official village business. 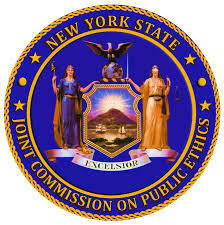 Sections of both NYS General Municipal Law and the Village Code recognize that there are rules of ethical conduct for public officers and employees which must be observed if a high degree of moral conduct is to be obtained and if public confidence is to be maintained in our unit of local government. We believe this resolution furthers these aims.